10% Fenbendazole paste. 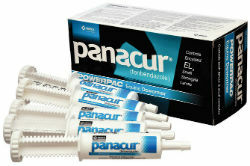 Panacur Powerpac Paste Horse Wormer is the only FDA approved treatment for all stages of encysted small strongyles. Because strongyles represent up to 90% of a horse's worm burden, it is important to treat all horses with PowerPac horse dewormer 1-2 times per year. Use in all newly arrived horses and then once or twice per year. Convenient, oral administration. Unique artificial apple-cinnamon flavor. Panacur® (fenbendazole) Paste 10% is administered orally at a rate of 2.3 mg/lb (5 mg/kg) for the control of large strongyles, small strongyles, and pinworms. One syringe will deworm two 1,250 lb horses. For foals and weanlings (less than 18 months of age) where ascarids are a common problem, the recommended dose is 4.6 mg/lb (10 mg/kg); one syringe will deworm one 1,250 lb horse. For control of encysted early third stage (hypobiotic), late third stage and fourth stage cyathostome larvae, and fourth stage larvae of Strongylus vulgaris, the recommended dose is 4.6 mg/lb (10 mg/kg) for 5 consecutive days; administer one syringe for each 1,250 lbs of body weight per day.